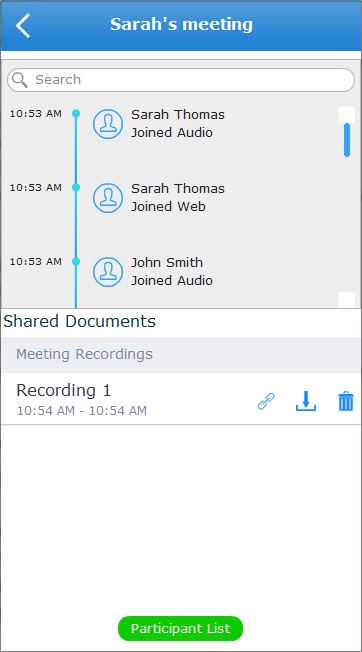 You can access meeting audio recordings through the Meetings tab of your desktop application. Note: You can record in meetings from the L'application mobile Virtual Office, but in order to access meeting recordings, you must use the L'application de bureau Virtual Office. In the main window of the L'application de bureau Virtual Office, open the Meetings tab from the navigation menu. The Meeting List pops up in the Past Meeting window. Click next to a meeting in the list to view its information. The meeting information shows a timeline of participants' actions, a list of recordings, and a Participants List button.